I remember first reading about Hagar, the Egyptian maidservant of Abraham’s wife, Sarah. Sarah and Abraham had no children, but desperately longed for them. Abraham knew God has said he would be the father of many nations, but Sarah, in her old age (we’re talking great-grandma age in today’s equivalence) assumed God meant that it would be with her servant, Hagar. As a slave, all that belonged to Hagar also belonged to Sarah. First, Sarah basically forced her husband on Hagar. Yes, it was legal at the time, but we certainly wouldn’t consider it the right thing to do now. When Hagar conceived almost immediately after Sarah laid barren all those years, Hagar just knew that meant Sarah was the reason for their empty household, not Abraham. And when Hagar rubbed it in Sarah’s face, Sarah abused her and kicked her out of the house! That left Hagar pregnant, homeless, exiled to the wilderness and all alone. It’s Hagar who named God, El Roi, the God Who Sees. And the same God who saw Hagar in her hard things will see you and I through ours. Stay up til 1 am helping autistic son with a science project. Get four hours of sleep. Wake up, take the kids to school. Continue writing newest book proposal. Bake cupcakes for daughter’s science assignment. Send out contract updates for second job. Go to sleep with four hours less sleep time than I planned. For as many things as I have on my plate, none of those include, “Return to the mistress who beat and abused you and whose husband’s child you are carrying.” But that doesn’t mean my hard things aren’t hard. It doesn’t mean past things weren’t equally unbearable. I bet there’s someone reading right now who’s criticized the list above and mentally said, “Well I would never…” But like Hagar, sometimes we can’t control the hand we’re given. Sometimes we have to take on three jobs to make our dreams happen, force those 15 minutes a day we work on our dreams because that’s all we can spare, brave being the single parent because that’s what our children need, or lose a friendship because we’ve chosen a path others don’t understand. Through it all, God sees. But He doesn’t stand by just watching as we get beat up by the bullies of life. Yes He sees, but He also loves you, and He cares about you as you’re making those hard decisions. For Hagar, her reward was the exact thing that was so important in those days: lineage. She would have more descendants than she could count. She would be blessed for her obedience. When we focus on what God has truly called us to do, we can face guilt, criticism, and misunderstanding. It’s a brave choice. Maybe no one has ever told you thank you for making those hard decisions. Thank you for not simply giving in and signing up or settling for someone else’s agenda for your life. Thank you for keeping God first and listening to what he has called you to do. I know there are other voices. I know there are other opportunities. I know you could walk away. And you haven’t. Good for you. It’s hard to be brave and keep going when it seems like no one sees. To be honest, sometimes it’s hard to keep going when only God sees, because we can’t see the reward for our sacrifices. And it’s hard to make sacrifices when it seems like there’s no purpose. But no matter how how insignificant it seems, saying yes to God is all that matters. In the end, it is El Roi who sees you. Take stock in all the things you’re doing. If there are things you’re doing that God has asked you to let go, let them go. If there are things God has asked you to do that are hard? Don’t not do them because they’re hard. If He’s asked you to do them, He’s already prepared the way. Wherever you are in your hard things journey, He sees you. He loves you. Keep going, friend. There was a time when I was a small business owner. In fact, simultaneously, I owned two businesses. In one company, I was a leader in Direct Sales and I’d risen to the top 4% of the company. My team was flourishing, business was good, and I was happily leading them with devotionals and encouragement as well as sales guidance. I’d found the perfect blend of faith and business. But little by little, I felt God calling me to write for Him, so I told my team that I’d be stepping down to follow Him. Stepping down felt right and I knew in my heart I was heading in the right direction. And then there was the other business. Started at roughly the same time, I worked hard into all hours of the night after my full-time job and my Direct Sales job, all while my family slept. I had dreams that this would become our family business. In my mind, I had roles for each person in my family that fit them perfectly. My son had named the business, and I thought this would be something my husband and I could retire from. But when God asked me to lay that business down just a few years in, I wasn’t quite so willing. In fact, for two years after I started hearing that still, small voice tell me to give it up, I hemmed and hawed and Jonah-ed my way around the topic. I hopped on that virtual boat to Tarshish, completely ignoring the fact that God had said to go to Nineveh. I even pseudo-quit once. I told my contractors and accountant that I was leaving because I felt God telling me to leave. And then I never. Actually. Left. That’s right. I told them I would leave and follow God, but I didn’t do it! Some of my contractors left for other companies. Others stayed, and get this – I even brought on NEW contractors! I had done the old “Eve” switcheroo by listening to the serpent as he hissed into my ears, “Did God really say that?” After all, wouldn’t God just stop sending business and contractors my way if He really wanted me to quit? Wouldn’t He just close the door? But dreamers, listen. There’s a difference between following God and having Him force you along. True faith cannot be forced. By my logic, Jesus would have walked up to them and ripped the nets from their hands, dragging them by their hair to follow him. He would have removed all the fish from the ocean to make their choice easier. But Jesus didn’t. He asked them to follow him, and immediately they dropped their nets, left their boats, and followed a man they’d never met. Sometimes God doesn’t stop sending business our way so we’re forced to quit and follow Him. Sometimes He asks us to follow in faith. It’s always our choice to follow Him, even when business is prospering and it makes no sense to leave our nets behind. I was asking God to make the choice for me because I thought my dream was better. If I’m 100% honest, I thought I could fish and follow at the same time. Faith can’t fish and follow at the same time. We have to remember that if God asks us to do a thing, He has already prepared the way. Satan, his schemes, and our own fears and misconceptions can stop us in our tracks. OR in my case, cause us to keep on doing that same old thing we were doing, rather than run freely toward the dream God has for us. Remember those fears I had? Not a single fear I had was valid. The truth was that I would have more time with my family because I wasn’t working multiple jobs. The truth was that I could hear that still small voice asking me to trust that God is big enough to provide for me, and I didn’t need that second job to provide. The truth is, no matter what others think of us or how we think we look to others, there is only one opinion that matters, and that’s God’s. If you’re on the fence, afraid of the calling God has for you, don’t be. He has already prepared the way. Raise your hand if you’ve got a girl tribe. You do? Good, me too! In fact, I’ve got a couple of them. I have my deepest-darkest-secret tribe – the ones who will take my secrets to their graves and help me bury the bodies of any who have wronged me. (I jest. Although I’m sure they would.) I have my work colleague tribe, church friends tribe, and of course, my writing/God-sized dreamer tribe. One of the most important pieces of advice anyone has ever given me was to surround myself with people I wanted to be like. (Proverbs 13:20) This included leaders, mentors, writers, great women of faith, and my personal favorite: older ladies at church whose grown kids are now normal, non-crazy adults who love God. Except sometimes, when you’re around great women who are doing great things, you start to feel less great than they are. Don’t misunderstand me… we’re not talking vanity or pride or even envy. We’re talking about those times when you’re with your tribe and you see all the great things they’re doing and all the great things you’re not doing, and that’s when the whispers start. You’ll never be that great. They’re way better than you. That last one hit me hard this year. For years I’ve had this dream of writing Bible studies “for the rest of us.” For those who want to understand God’s Word but are new to the faith, new to studying, new to the stories that some folks seem to know like the back of their hands. I’d dabbled for years, writing on TOPICS in the Bible, but I really wanted to write studies on the full books in the Bible that everyday people could understand. So this year, I started. My agenda was rocking with plans to write three, maybe four studies! I’d decided we’d start by studying Genesis together on my blog and Facebook page for the month of January. I had everything set up. A study plan, graphics, you name it. It was wonderful and glorious, and I felt emboldened and impassioned and all the everything. But about halfway through the month, I skipped a blog post day and some other pseudo-catastrophe happened and next thing you know, January was over and the Genesis study was only halfway written. Boy, had I failed God. 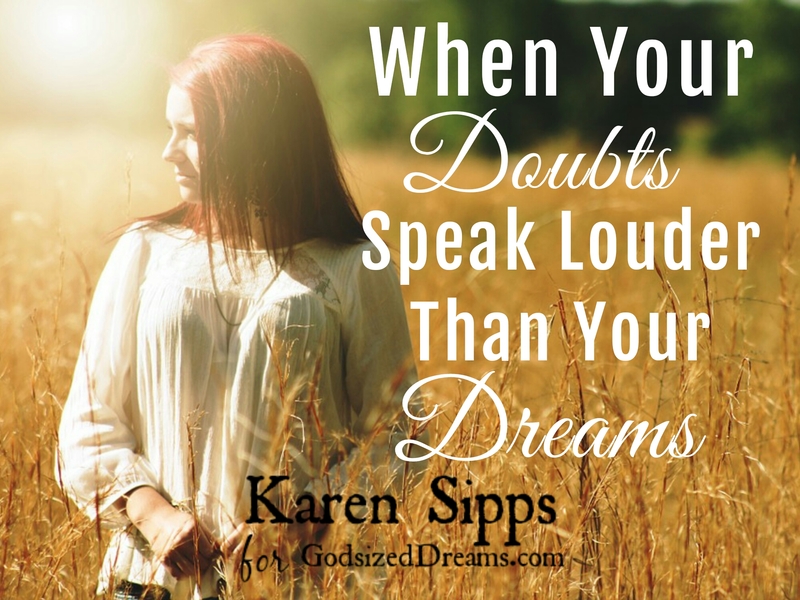 Doubt didn’t just tiptoe in, it made itself at home and stayed awhile! I told myself that no one was reading, so what did it matter? I listened to the whispers that told me God was disappointed in me because I didn’t finish my goal in the time limit I’d told everyone we would finish. I told myself that there were better authors, better studies, and that people need paper books instead of an online study. I told myself that there was no use in finishing because God would have someone else lined up, ready to take my place. Basically, every doubt Satan needed to feed me to get me to stop doing Kingdom work, he did! Thankfully, an accountability partner wouldn’t let me give up. Yes, it was months later when my “January study of Genesis” started back up, but I’m grateful that she stepped in to remind me that Satan’s whispers should never be louder than God’s Truth. No, it wasn’t done the way I planned, but I’d begun again, and I’ve learned several lessons along the way for the next study. And there will be a next study. So the next time you’re tempted to believe the lies of the evil one as he tries to stifle your kingdom work by planting seeds of doubt, remember these truths. 1. Your work matters. Keep going. And keep your eyes on Christ, not on the competition, because when it comes to your God-given gifts and abilities it only matters that you do it, not that you do it better or worse than anyone else. Just do and let Him work out the details. 2. Your audience is unique. Yes, your friend may have an amazing talent and a huge following, but your talent and single solitary blog reader are important. You never know this side of heaven how your gift and talent was used to serve the Lord. And if you have no readers at all? No buyers, no fans, no likes, no whatever? Keep going, because it’s all for Christ anyway. Serve wholeheartedly, as if you were serving the Lord, not men, because you know that the Lord will reward everyone for whatever good he does, whether he is slave or free. Let the truth in God’s word be the guiding light you need to keep going when your own light is dim. Let the truth in God’s word be the guiding light you need to keep going when your own light is dim. Encourage your tribe when they need it, and let them encourage you in your seasons of doubt. Because the real truth is you are amazing and ALL of you are needed. When I worked as a leader in direct sales, we had an exercise called “dream boarding.” Dream boards held visual pictures of our dreams and goals on poster boards, along with dates we wanted to achieve the dreams by. I encouraged my team to not just have a photo of each dream they wanted, but to make a plan to get there… to break the goal or dream down by the necessary action items we needed to take to get there. I even conducted a company-wide training event for all consultants on visioning, explaining the three parts of the brain that were engaged when dream boarding was invoked. As far as dream board creation goes, I could dream like nobody’s business. I called it visioning, because in my eyes dreaming was passive, while visioning was active, hard work. It was the things you did to make the dream come to life. The great thing about each goal and dream, is that as they were whittled down one by one, a bigger, better dream was put in its place. Make Senior Consultant? Check! Next goal: Director! Make Director? Check! Next goal: Develop my team members and help them meet their goals! Check, check, aaaaand check! Next goal? You get the idea. On one hand, it was amazing to see my list of goals and dreams whittled down one by one, as I pushed myself to do the next hard thing. I’ve had this list of God-sized dreams forever. I’d done the work. Put in the hours. Put in the years. One by one, I watched God bring the harvest I’d desired for so long and answer my prayers to achieve each goal. Each dream and goal that God allowed me to achieve was so humbling – that He would care about even the fine details of the passions I’d held so close to my heart for long. At the same time, as this list of dreams I’d held so close for so long dwindled down to just a few dreams left unchecked, I couldn’t bring myself to put new things on the list. Instead of replacing the achieved dreams with new ones as I did so easily in direct sales, I found myself looking at a crossed out list with no idea what to do next. Because sales goals were easy to achieve, and the next step in the plan was easy to see, I could pick them off one by one like the petals of a daisy. But these God-sized dreams were lifelong. They were precious. I considered myself blessed that God would bring the harvest after the working season, but didn’t dare ask Him for more harvest seasons, because He’d already given me more than I’d even imagined. And if there were no more harvests… if there were no more dreams on my list, I’d count myself blessed. At the same time, I worried if my “usefulness” was complete, as if God would somehow decide that the talents He’d given me had an expiration date. I had no idea what to add to the list — if anything — because what He’d already given me was of epic proportions. Asking for more seemed selfish. Self-serving. Self-promoting. Ungrateful. I even had a friend ask me why I wasn’t promoting my Facebook page. “Because I don’t want to promote myself. If He wants to grow it, He will,” I said, believing on 1 Corinthians 3:7. So I looked at harvest cycles. I needed to know what to do now that my list was almost complete. I needed to know what farmers do after the harvest. You see, farmers expect harvest. Not just one harvest. If God gives them the skills and desire to be a farmer, they’d need to, well… farm routinely. It’d need to be a cycle, not a one-time gig. And to have a successful harvest cycle, they spend the time after the last harvest, preparing for the next harvest. They don’t just run right into planting with no preparation. They analyze their crops. Identify what worked well. Identify what didn’t. They clean up their machines. Perform needed maintenance. Prep the fields for upcoming planting. They know that it’ll be awhile before the next harvest, that there’ll be plenty of hard work before the harvest, and that the better they prepare for the harvest, the better that harvest will be. 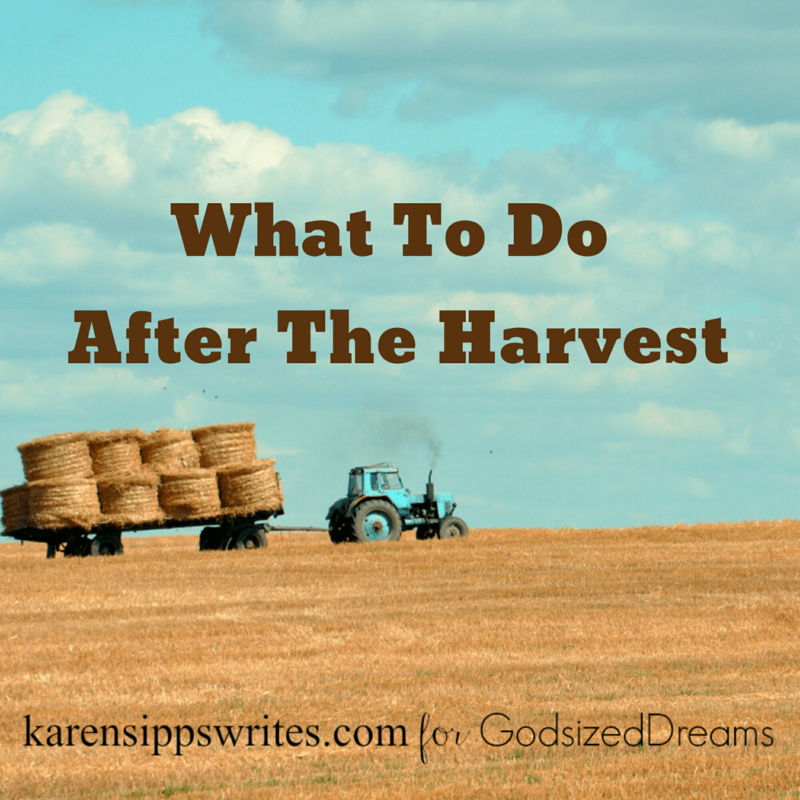 I think sometimes as dreamers, when God allows us the gift of harvest, we forget that it’s not really our harvest. Oh, we receive the blessing of the harvest. But the results we have using the gifts, talents, and abilities He’s provided are a yield for Him! I looked at the harvest as God’s gift to me. In a sense, it absolutely was. At the same time, our harvest is a love offering we can lay at His feet! But I don’t want to bring Him just one season’s worth of harvest. I want season after season, to lay crowns of obedience and fruitful harvest at His feet. Our harvest is a love offering we can lay at His feet. So farm on, dreamer. If you’ve seen your harvest and are wondering what on earth to plant next, remember the cycle the farmer follows. 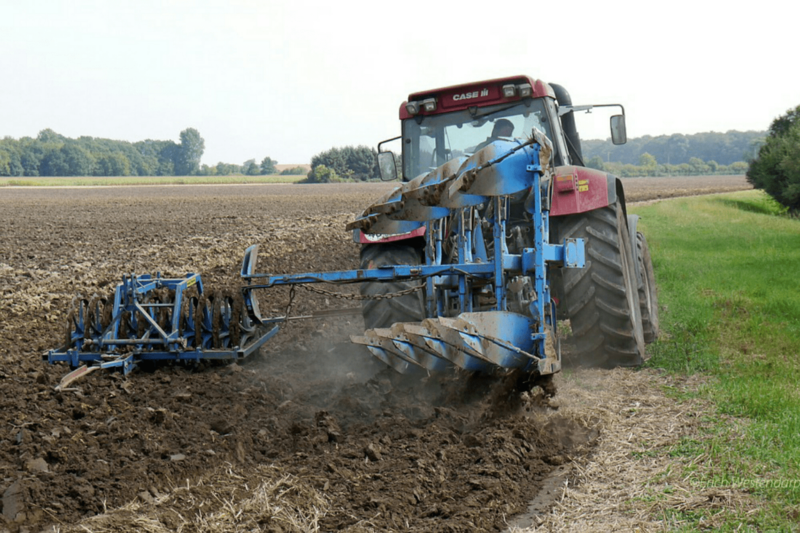 Before the next planting season, analyze what worked and what didn’t, perform needed maintenance and prep the fields by spending time in the Word. When your fields are ready, He’ll tell you exactly what to plant and when. Sometimes God works on a dream with immediacy. Other times, we face roadblocks. Look at Nehemiah. He had one of the most important jobs as cupbearer to the king, yet was so boldly impassioned with a dream to rebuild the wall of Jerusalem that the king allowed him to leave his job to rebuild that wall. In Nehemiah’s case, God not only gave Nehemiah favor to leave his job, but also gave him wisdom to ask for the supplies and protection he would need to get the job done. Even with opposition, even when half the crew continued building while the other half stood guard, Nehemiah and the people rebuilt an entire city wall in fifty-two days. When God gives you a vision, He gives you the supernatural ability to make it happen. Maybe you’re asking yourself why God would help Nehemiah so quickly… and why He would take so long to help you? 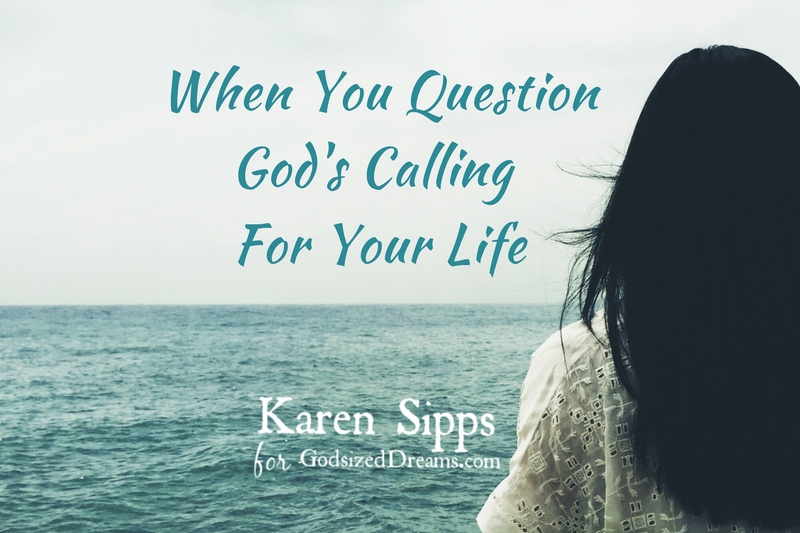 Why doesn’t God give you fifty-two days off work plus supplies to focus on your dream or move mountains to bring your God-sized dream to fruition? Here’s the thing we have to remember. N0 God-sized Dream is more significant than another. Not the quickly-accomplished Nehemiah dream, and not the why-is-it-taking-so-long dream that you have. And neither one has less importance to God. Many dreams – including mine – seem less like Nehemiah’s and more like a 40-year Moses-led trek through the desert. A little progress here, a step forward there, mix in some wailing and complaining, with small manna-and-dove miracles along the way to encourage you to keep following… keep going… despite the roadblocks. And there will be roadblocks. My roadblocks look a little different than Nehemiah’s did. There were no threats of war or conspiracies in my dream like Nehemiah had. When I was a kid I dreamed of writing children’s stories and teaching English. Then I hit a roadblock when a guidance counselor recommended engineering “because teacher’s don’t make any money.” At the time, I lacked the confidence to stand up for my dream. It became what I call a “shoebox dream,” meaning that I tucked it on the closet shelf of my life behind the blankets and mementos. Meanwhile, I chose the career that everyone else suggested and life happened. I would get married. Switch jobs. Earn three collegiate degrees. Relocate to the South. Build a house. Become a mom to twins. Lose three jobs to layoffs and plant closures. Open two businesses that I worked in addition to engineering. Annnd move eleven times (I like to think of it as our own personal witness protection program). But I have learned to recognize the roadblocks for what they are: the actual path. You see, while I was doing all of those wonderful things – moving, and building, and momming – I noticed the manna. I’ve seen the doves, and they’ve kept me going. One morning ten years ago, I realized I’d left my twin infants’ milk on the counter at home. A half hour into my hour-long commute, I turned back to get it. That “mistake” made my commute two hours long, allowing me the chance to listen to a radio show I never listened to, and connected me to a Christian author and his editor. 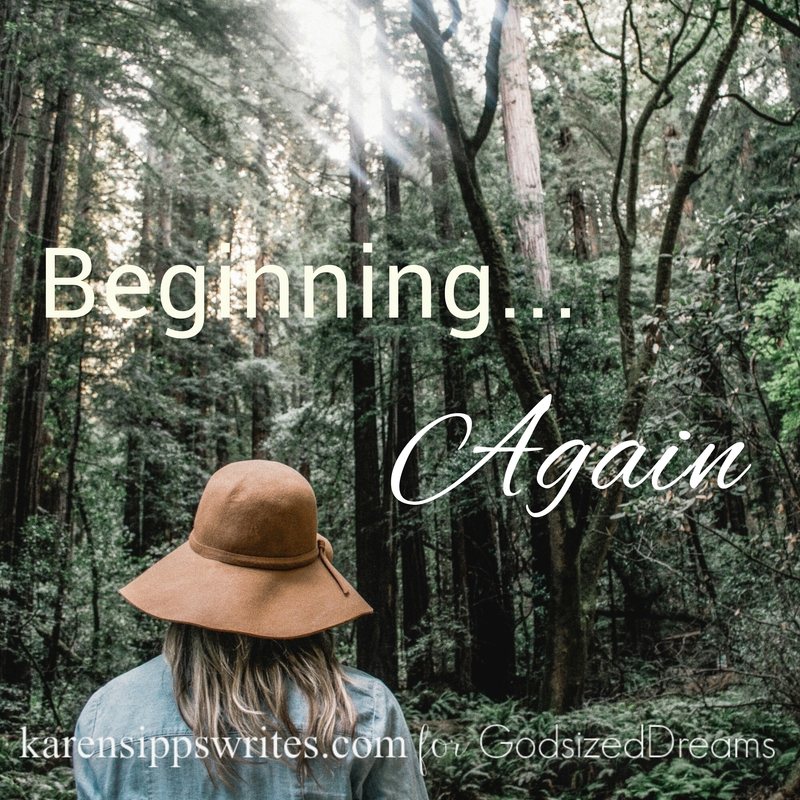 That first dove-in-the-wilderness rekindled my shoebox dream from years ago as I realized my God-sized Dream would not rest until I pursued it. As for my other roadblocks? That engineering degree, while not what I originally intended, has provided for my family during times of layoffs and slow periods in the economy. It’s also paid for conferences, website costs, and author expenses. The “part-time business” became the training ground I would need to begin speaking publicly, and built my confidence, as well as my strength in the Lord. Through it, I was able to encourage thousands of women to seek the Lord in their businesses as well. And through the “witness protection program,” I can look back now – even if a move was painful at the time – and see how God introduced me to people, taught me life lessons, or brought me closer to Him in the process. In a nutshell? My roadblocks were never roadblocks at all. They’ve been the path all along, winding and weaving as I picked up things I would need along the way. 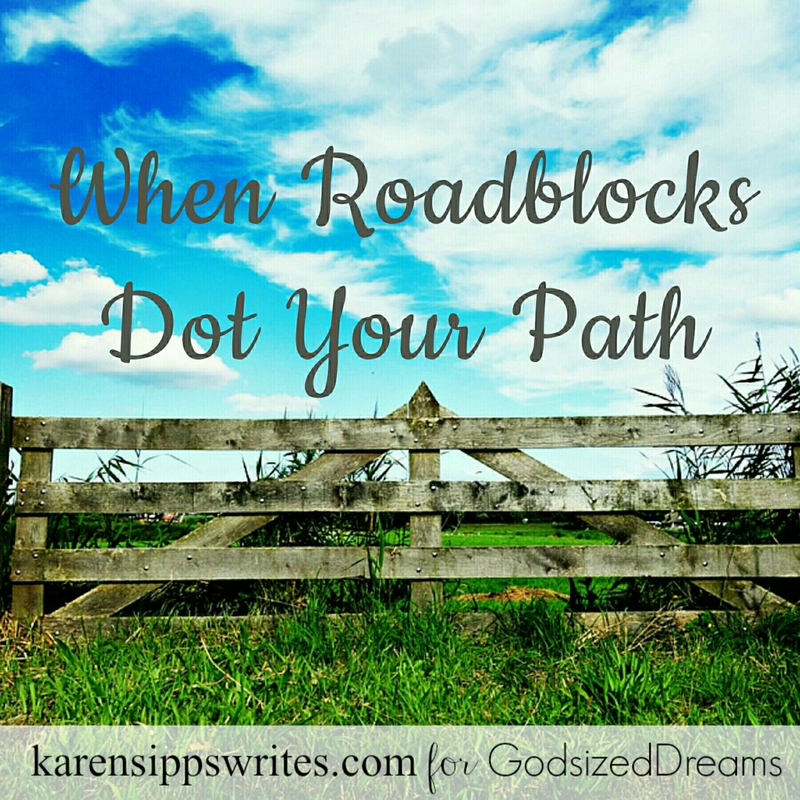 Let me encourage you… Your roadblock? It may not be a roadblock or detour. It may just BE the path he purposefully takes you on, to accomplish the Dream He has IN you. Look for the manna. Praise Him for the doves. And keep going on the beautiful, perfect path He has designed for you.